I've already talked here and here about how AHA (alpha hydroxy acid) peels are some of the most effective cosmetic treatments out there. You can get them done at a cosmetician, buy products with AHAs or (my favourite) mix simple ones by yourself. But for those of you who can't get their hands on AHAs, or want to save some money, or prefer the most natural solution, here is an idea: the Kombucha scoby face mask. Kombucha contains several acids including lactic acid and vitamin C, which means you can expect it to exfoliate old skin cells, lighten discolourations, brighten the skin and help with fine lines. Fermented stuff is generally good for the face and body. Kombucha is an active ingredient in many anti-aging skin products. To those of you who haven't had a taste of kombucha yet: it is a probiotic culture, a symbiosis of good bacteria and yeast. It looks like a very slimy pancake (the scoby), floating on top of the kombucha. Kombucha is extremely healthy, populating your digestive system with all of the good bacteria and reducing the acidity of your body. I like to drink a little bit of kombucha every day in the morning (alternating it with cider apple vinegar, thinned with water, of course). Cosmetically, kombucha can replace acid cider vinegar for things like hair rinses or toners. Since scobys multiply, it should be really easy to get one for free or for a few cents. Start by asking on facebook, chances are someone you know brews kombucha. If you can't get your hands on kombucha, you can also use water kefir crystals, which have very similar properties. I got my kombucha scoby and water kefir crystals off ebay. Water kefir is often available in Latin or Mexican stores. I don't recommend commercially sold kombucha drinks, since the kombucha is usually not "ripe" enough and most probably not living. If you can't find a scoby, you can grow one if you have some pre-made kombucha. Here is a nice guide to brewing your own kombucha. Once your scoby has created another layer, you can use the old one for a face mask. The easiest method is to blend it with a mixer and apply on the face, neck and decollete, however you can also plonk the entire scoby on your face. Keep on for 15 minutes then wash off. 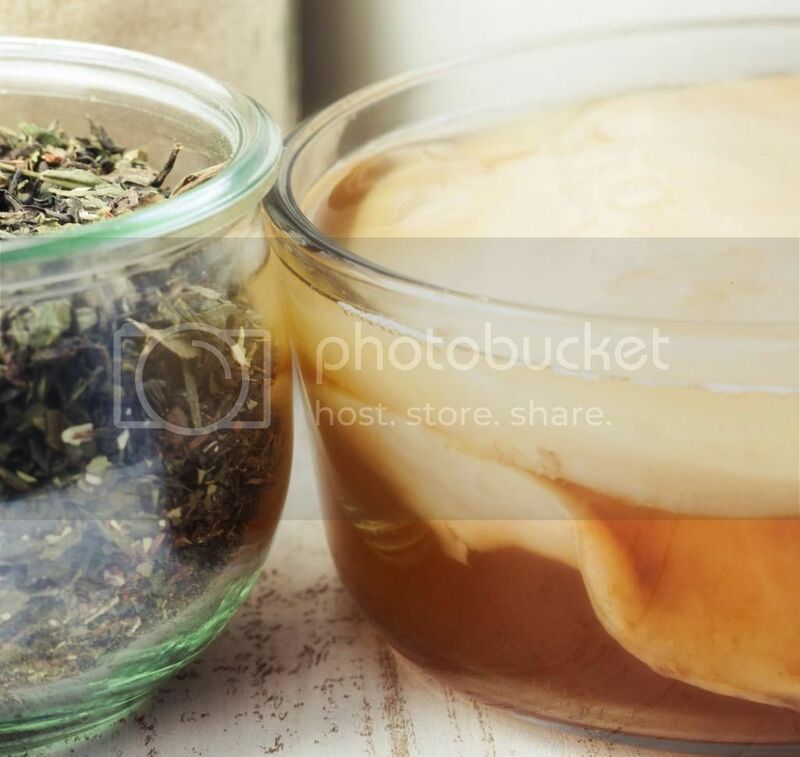 If you feel that the kombucha scoby is too acidic, you can mix the blended scoby with yoghurt. For a whole body treatment, add half a litre of kombucha in a bathtub. If you don't have a bathtub, dip a sponge in a diluted kombucha and rub your body with it. The kombucha can be used for all skin types, including acne. Apply the kombucha mask once a week or two. Any kombucha / water kefir fans out there? Have you ever tried using them on your face? Also, my favourite mix (to drink) is with peaches, what's yours?